National Cookie Day is a food-related holiday dedicated to one of the world’s most popular treats. Celebrated on December 4 every year, it is a perfect occasion to indulge yourself with your favorite type of cookie, be it peanut butter, chocolate chip, oatmeal raisin, or even all at once! Cookies are small and flat baked (or sometimes cooked) treats, usually made with flour, sugar, and cooking oil or butter. Cookie dough can have oats, raisins, nuts, chocolate chips, berries, spices or other ingredients stirred in. In most English-speaking countries outside North America, these treats are typically called biscuits. 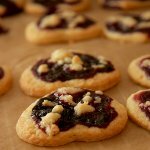 The word “cookie” is derived from the Dutch word koekje which means “little cake”. Cookies are believed to have originated in Persia. They were brought to Europe during the Muslim conquest of Spain and quickly spread throughout the continent. In the 17th century, cookies were brought to America by Dutch colonists. The Dutch word “koekje” became anglicized and transformed to the present-day American word “cookie”. In the UK, it is sometimes used to refer to chewier treats, while crisp ones are traditionally called biscuits. Cookies differ from cakes and other kinds of sweet pastry in that cookie dough generally doesn’t contain any water as a medium of cohesion. Instead, it contains more oil or butter, which results in a much denser structure. Cookies can be baked until crisp or just long enough to remain soft. Cookies can be classified according to the way they are formed. There are drop cookies, bar cookies, filled cookies, pressed cookies, molded cookies, rolled cookies, sandwich cookies, and even no-bake cookies. No-bake cookies are made by mixing cereal, nuts, or other filler into a melted confectionery binder, shaping, and allowing to cool or harden. Although the origin of most food-related holidays remains unclear, National Cookie Day is one of the few exceptions. It was created by Matt Nader, the founder and owner of Blue Chip Cookies. Blue Chip Cookies is a chain of gourmet cookie bakeries and online stores headquartered in Milford, Ohio. Founded in 1983, the company is known for creating the first white chocolate macadamia cookie, which is now its specialty. Nader launched National Cookie Day in 1987 in order to promote his company and its products. Other cookie manufacturers jumped at the chance to boost their sales, and soon National Cookie Day became truly nationwide. Although the holiday doesn’t have an official status, it is widely celebrated by cookie lovers all over the country. By the way, some of the most popular cookie types in the United States include sandwich cookies, chocolate chip cookies, butter cookies, ginger snaps, oatmeal raising cookies, peanut butter cookies, and more. To celebrate National Cookie Day, pick up some of your favorite cookies at your local bakery or bake a tray of cookies yourself. With Christmas right around the corner, National Cookie Day is the perfect occasion to try and perfect new Christmas cookie recipes. Make sure you’ve baked enough cookies to share with your family and friends!